Now there is an exciting documentary film coming in 2019! In the 150 years since we discovered that microbes cause infectious diseases, we’ve battled to keep them at bay. But a recent explosion of scientific knowledge has led to undeniable evidence that early exposure to these organisms is beneficial to our children’s well-being. It turns out that our current emphasis on hyper-cleanliness and poor diets are taking a toll on our children’s lifelong health. B. Brett Finlay and Marie-Claire Arrieta have written an engaging and important book that explains how the millions of microbes that live in our bodies influence childhood development; why an imbalance in those microbes can lead to obesity, diabetes, and asthma, among other chronic conditions; and how–from conception on–parents can take concrete steps to positively impact their child’s long-term health. 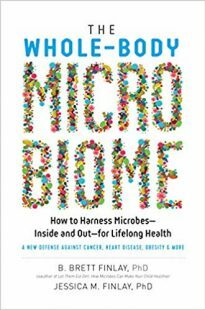 The authors delve into the role of microbes in everything from pregnancy nutrition and birthing methods to choices about feeding and lifestyle (“Should we have a pet?” “Should I give my child an antibiotic and a probiotic?” “Should I let him/her play with a friend who’s ill?”). 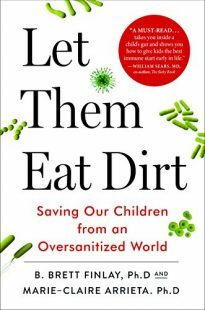 Based on the best scientific literature published to date —including the authors’ cutting-edge work— this book will change the way you view dirt and food, and empower you to give your kids a healthier start in life. New documentary film with updated research! Allergies, obesity, asthma, intestinal disorders, auto-immune diseases, and diabetes are all on the rise, with some even doubling every ten years. New research points to changes in the complex ecosystem of microbes that live on and inside every one of us – our microbiota – as a major cause. But how could microorganisms that live in your gut affect the odds you’ll develop asthma, a disease of the lungs – or diabetes, a metabolic disorder? Let Them Eat Dirt: The Hunt for our Kids’ Missing Microbes connects with young families, researchers, and doctors to sleuth out what’s harming our microbiome and learn what we can do to reverse this dangerous trend. Check out Dr. Finlay’s new book with his daughter & environmental gerontologist, Dr. Jessica Finlay.